I am always surprised at how often people tell me that they are not artistic or creative. In our culture you must have exhibited in a gallery or performed to be called an artist. I play at playing music and music keeps me sane or at least as sane as I can be in this sometimes-crazy world. I am therefore a musician and so are you. Your heart keeps great time. Music is a great way to come together in community and share joy. I have played with people in Japan, Thailand, and China where our only common language was music and everybody had a great time. I take stuff out of the trash stream. My wife laughs when I wont let her throw out old salad bowls and wooden spoons. I make instruments that sound good, are relatively easy to learn to play, and are affordable. Many people shy away from learning to play music because cheap instruments usually sound bad and good instruments are too expensive. I have fun creating usable art for public consumption. If it’s not fun, why do it, Right? The RE Store is my primary source for materials and I draw my inspiration and design ideas from indigenous instruments from around the world. I spend a fair amount of time in the plastic pipe section. My didgeridoos are the least expensive and easiest to make and the most difficult to play. They’re made from 1.5” to 2” PVC pipe. I have heard $100.00 didgeridoos that don’t sound as good. My Santori Flutes, modeled after Native American Love Flutes, are made from ¾” PVC. I add wooden mouthpieces turned from wood I find in the scraps bin. 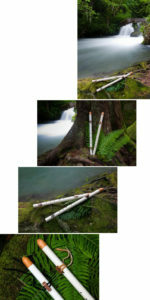 The great thing about the Satori flutes is that they are indestructible. Throw one in your backpack and you’ve got music in the wilderness. Practice 15 minutes a day and you’ll be sounding pretty good in just a month. The Fujara, a Slovakian overtone flute, is both difficult to make and difficult to play but it’s so odd that just having one will draw attention. I find my greatest limitations to creating and playing instruments is my own imagination and my willingness to try new things. My bamboo Zither is an example. I didn’t know how to play it or even if it would sound good, but I gave it a shot. It worked and sounds great. I am sure more of those are on the way. Even if it sounds trite, you don’t know what you can do until you try. 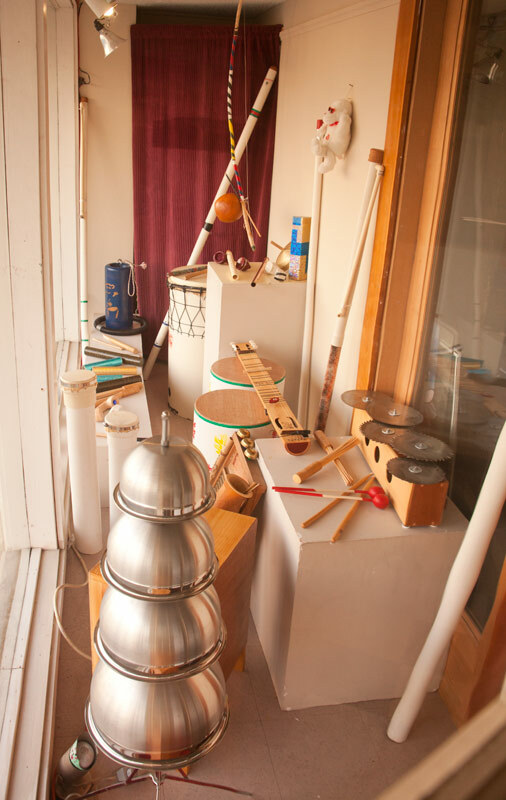 You can view Doug’s musical instruments on display in the Meridian windows at The RE Store in Bellingham through August, 2012.